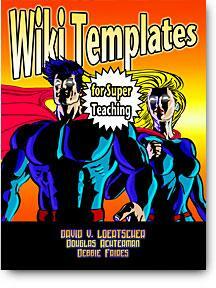 New features for 2008, and all 50 templates are available for PBWiki. Instructions for new purchasers are given in the instruction booklet. If you already own a copy, email reader.david@gmail.com to gain access. A wiki is a collaborative workspace ñ a way groups can build a document, an article, a project or do other collaborative writing or planning together. Most of us know about Wikipedia.org ñ the largest encyclopedia in the world where anyone can write an article and anyone can edit it. The 50+ templates in this collection are collaborative spaces where the Think! Models of Ban Those Bird Units and SuperTeaching can be put into practice on line. And, best of all, at this point, they can be used for free from anywhere in the world. The templates in this collection have been designed for use in Seedwiki.com software, primarily because when the students begin the editing process, they will see a familiar word processing toolbar much like Microsoft Word. The templates can be tweaked to be used in any other wiki software. How do you use them? First, you get your own account on Seedwiki.com. Then you create your own wiki for a unit of instruction ñ say Causes of the Civil War. Then you copy a template from our disk into your wiki; add specific directions, and itís ready for student work. This will jump start your use of this technology and provide instructional designs that match the 15 Think models created by Loertscher, Koechlin, and Zwaan. Not only can you use the templates as designed, but they are easy to modify for your particular use. Once you see our instructional designs, you can build your own from scratch.